Apologies if we haven't been blogging lately. We promise to go back to "regular programming" when the time comes. But right now, to be honest we are not in the mood....sorry about that. And yes, our hits and pageviews may be suffering but that's the least of our priorities right now. 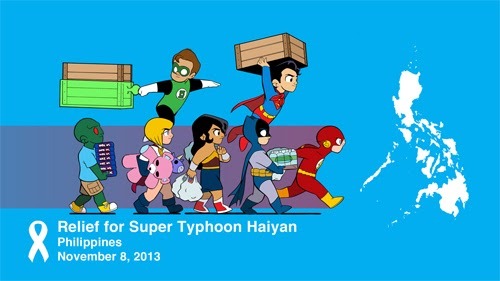 We enjoin everyone to find whichever way you can to help with #ReliefPH -- whether it's a silent prayer, a doze of positivity amidst the negative bandwagon, donations, volunteering, attending an event that has relief efforts, taking calls for a telethon, whatever is suitable for you....please help in any way you can. 1. If you haven't used up all of you wedding funds yet, why not revise your plans and make your wedding a simpler one so you can use the extra budget to donate. Make sure though that you are donating through a reliable organization such as: World Food Programme, Red Cross, GMA Kapuso Foundation, etc. 2. Use your reception event as a drop-off point for donations. Enjoin you guests to donate. Tell them in advanced that you will be putting donation bins and donation canisters at the registration booth of your reception and that this can be in replace of the wedding gifts. 3. Instead of the usual reception programme, why not host an auction? 4. In replace of wedding souvenirs, tell your guests that you will be providing food/water/medicine et al to typhoon victims on their behalf. 5. Lastly, find other creative ways to incorporate it in your wedding as inspired by the immediate need to help. For instance, are you a doctor and most of your guests are going to be from the medical field? Then perhaps instead of a guest list you can put a petition book that can help mobilize your guests to action. Or maybe instead of a photo booth, you have an area where people can create words of encouragement? Something that can be posted on social media to combat the negative ones that are being churned out? You and your wedding can be an instrument of change, and an instrument to inspire others to do the same. "Giving opens up the door to receiving. And you have so many opportunities to give every day. Give kind words. Give a smile. Give appreciation and love. Give compliments. You can give a warm greeting to the newspaper stand person or the person who makes your coffee. You can give by allowing a stranger to go ahead of you. If someone drops something you can give a helping hand and pick it up for them. And you can give appreciation and encouragement to everyone. And that is one of the secrets to receiving. Rhonda Byrne from #TheSecret Daily Teachings #LOA"